Are you in need of a new fence for your home or business? If you answered yes, then the folks here at Roots Landscaping are the perfect team for you. Our licensed professionals are committed and dedicated to providing all our clients with top of the line products and services that will simply not be matched by any of our competitors. 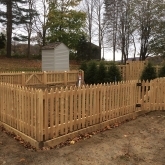 Having designed and completed a wide range of fencing projects here in the Middlebury area, we are confident our clients will recognize our workmanship and performance excellence. Take time out and contact our staff to schedule your free consultation with our reputable team of professionals today. Our licensed team prides itself on our professional yet friendly approach to resolving all types of fencing issues. We work right alongside every client in our diligent efforts to provide them with effective and efficient fencing solutions. 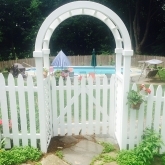 A member of the American Fence Association and a highly accredited company with the BBB, we have been billed as your ‘go to’ company here in Middlebury and the surrounding towns for all your fencing needs. When you choose us, you are putting your trust into the hands of some of the absolute best in the industry. 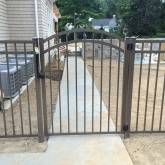 Whether you are in need of a fence for privacy, security, noise reduction or for the safety of your pets and children, rest assured our licensed team here in Middlebury handles it all. Our goal here at Roots Landscaping is simple – to provide 100% customer satisfaction to our customers. 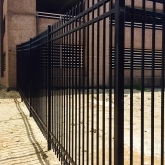 We provide only state of the art, high-quality fences and effective installations, which has served to earn us a spot at the top of the marketplace charts. 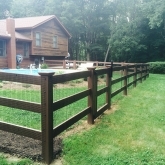 For more information about our fencing products and our services, visit here. Here at Roots Landscaping you are always our #1 priority. Our friendly professionals are steadfast in solving the problems of all our clients and in doing so to accommodate not only their timelines but work within their budgets as well. We fully understand the challenges that come into play when having to install a whole new fence, or invest in repairs to your existing fence. Our skilled consultants are on hand to answer all your questions, and address your every concern. Once you have determined which option suits you best, then the rest is up to us. If your current fence is in need of repairs, our skilled technicians and installers are equipped to handle repairs of all types. 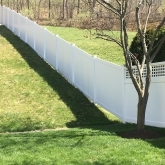 In addition to our industry recognition for the installation of new fences, we enjoy a high visibility in the marketplace for our innovative, top of the line repair services and techniques as well. Whatever your repair needs may be, remember we are the team for you. At Roots Landscaping we are equipped with the latest technologies and software, in addition to state of the art, effective repair procedures. Following our complete analysis and assessment of your damage, our team will provide you with a full estimate for repairs needed and will strive to work within your budgets and your timelines. One of the most common fence problems is that of rotting wood which is typically caused by fungi and decomposition. Our team of professionals is focused on getting to the ‘root’ of your problem and in doing so will determine an appropriate course of action. The typical protocol is to chemically treat the wood, and then either patch it, repair it, or stain it. The repair method we choose is primarily dependent upon the severity of the damage and the type of fence. We find often that replacement of the fence is the better approach rather than a simplified repair option. 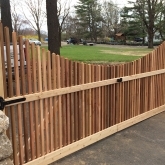 Despite the extent of damage and the repair or replacement needs of your fence, the friendly team here at Roots Landscaping in Middlebury have definitely got you covered. If shifting poles are the cause of your fence damage, then replacement is the typical and often the best solution. Replacing the poles instead of attempting to repair them, will avoid further deterioration and the collapse of all or part of your fence. Once replaced, new poles help to renew the stability, durability, and both the structure and strength of your fence. Holes and cracks create problems for fences of all types. Whether a wood fence, vinyl fence or even a chain fence holes or cracks cause a good deal of damage and even deterioration. With that said, engaging in a repair process as soon as possible is your best solution. To provide you with an effective solution, our professionals here at Roots Landscaping will need to perform a full analysis and assessment of the existing damage. Once we have completed our inspection, we will submit a full estimate of the repair work to be performed in order to restore your fence to its ‘like new’ condition all over again. Last, but definitely not least, missing boards and panels can be detrimental to the structure and integrity of your fence. If they are not replaced within a reasonable period of time, your fence and its overall structure can very well be compromised and portions of your fence and perhaps even the entire fence can even collapse. To avoid costly repairs, we highly recommend the replacement of missing boards and panels as very soon as possible. 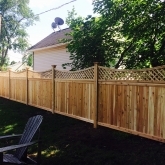 If you are a homeowner or business owner in the market for a new fence here in Middlebury, or are in need of repairs to your existing fence, then surely you have come to the right place. Whether new installs or repairs, we are the #1 team for you! If you would like to learn more about our company and our services, then contact the team here at Roots Landscaping today, and if masonry and landscaping services are on your upcoming project list, then reach out to us at 203-702-4408 today. You’ll be more than glad you did!